WSO2 BB season was ended two days back with a nail biting final. So with that experience, I thought of writing a blog after a long time. I’m playing for Legion and we were good enough to reach the finals this time. But unfortunately ended up losing to Wild Boars by 2 points in the finals. This post by Heshan explains the entire story and I’m not going to repeat it. But I’m trying to explain what I felt after the match. This is the 3rd annual WSO2 BB tournament. In 2008 and 2009, Legion were only able to reach the third place. So this was our first finals and we reached it by beating the defending champions, Titans. Last first round match was played between Legion and Titans on the 21st of October and we needed to win it with a 10 points lead to reach the finals. That was one of the best days for Legion and we won by 11 points and reached the finals. I think we scored our last basket within last 10 seconds of the match and we had our share of luck on that day. We were thrilled and had some hope about the finals as well. 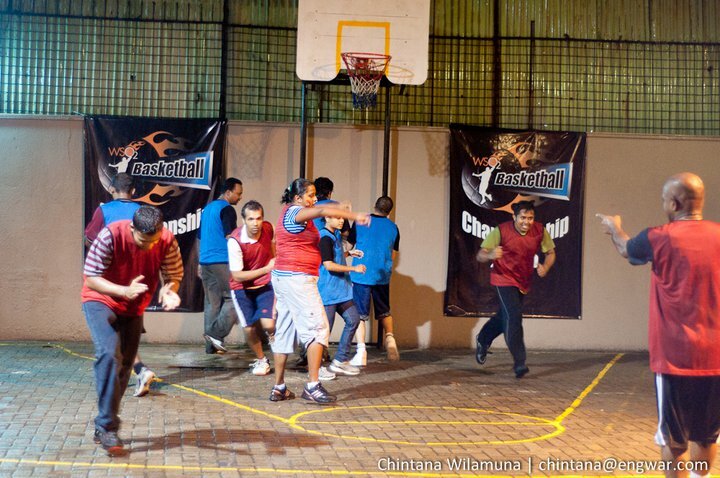 Because, Titans is the only team which has four great shooters Lahiru, Sameera, Supun and Akila. I think we played extremely well in the finals as well. Charith was amazing with his shooting accuracy and Waruna was rock solid with his defense as always. Dr. Sanjiva lead from the front and guided us really well. I also could support with few baskets. As Heshan has already mentioned in his above post, we didn’t know that the match is going to end until the referee’s final whistle. When there were 30 seconds to go, scores were level at 42:42. I was defending Samisa and he had the ball in his hand and just threw the ball from about 10 meters from the basket. I didn’t try to disturb him because the chance of scoring from that distance is minimal. But unfortunately for us, it went into the basket and didn’t even touch the ring. If I knew that we were within last 30 seconds, I could’ve easily defended him. So we didn’t have our share of luck and they had. Other than their luck, they had a fabulous player in Heshan who almost pulled the game alone. I think he scored more than 30 points out of their 44. So that’s what happened on that rainy and hot night. Actually it was a brand new experience for me. Because, I’ve never represented my school or university in any sporting event. So this is the first time I understood how a sport can inject spirit into you. It’s amazing how you get pumped up in such an atmosphere with a big crowd. I know I’m still a baby when it comes to BB :). But still I felt how thrilling it is to become a sportsman and represent your house, school, country or what ever it is. In summary, I didn’t have that feeling on the day I got 3A’s in my Advanced Level examination or on the day I won the gold medal for best academic performance in CSE. So finally I have a small message. If you are only 12, 13, 15 years old and schooling, go ahead and play whatever sport you can for your school. It will never ruin your studies and will inject the strength to face the world. It will immensely help you to develop your personality.